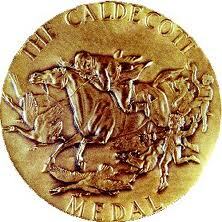 I remember searching for the shiny, gold, Caldecott medals on book jackets as a child. I’d comb the library shelves looking for that beautiful sticker. I learned early on that the special gold seal marked the book as a stand-out in children’s book illustrations. The award was named for illustrator Randolph Caldecott. Each year, the American Library Association selects one winner, as well as a selection of honor books. The 2013 winners have been announced, and I wanted to share them with you! 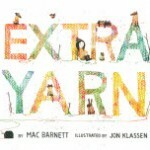 This understated picture book is certain to spark the imagination of every child who comes upon it, and what could be better than that? Annabelle lives in a black-and-white world, where everything is drab, drab, drab. So imagine her surprise when she finds a box filled with yarn of every color. Armed with the yarn and knitting needles, she makes herself a sweater, but after she finishes, she finds that she has extra yarn left over. 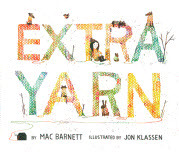 After knitting a sweater for her dog, her classmates, and various (hilariously unsurprised) bunnies and bears, she still has extra yarn. So, Annabelle turns her attention to things that don’t usually wear wool cozies: houses and cars and mailboxes. Soon an evil archduke with a sinister mustache “who was very fond of clothes” hears about the magic box of never-ending yarn, and he wants it for his own. In this original concept book, Seeger engages all the senses with her fresh approach to the multiple meanings of “green.” Using thickly-layered acrylics, word pairings and cleverly placed die cuts, she invites readers to pause, pay attention and wonder. Energetic line and dizzying perspective combine for a rollicking tale of Father, Elliot and a highly improbable pet (or two). Buzzeo’s text, brimming with sly wordplay, earns its perfect counterpoint in Small’s ink, watercolor and pencil illustrations with chilly details and visual jokes that invite many repeated readings.